Clear beveled crystal is held in place using solid black crystal. This classic embellishment adds visual interest to a combination of solid optical crystal and black glass. 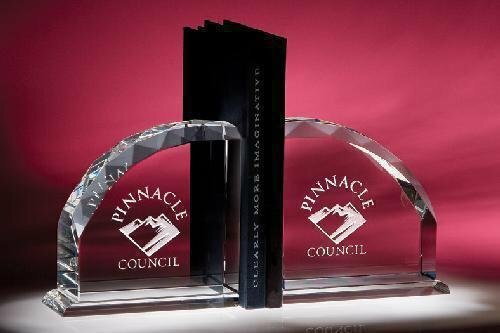 If uniqueness and sophistication are requirements for a corporate award program, then the black glass and optical crystal Mirage Award is a perfect choice. The flair of this exquisite optical crystal award provides recipients with an outstanding award of achievement. This award is elegantly mounted on a base of black crystal. A desk accessory that is sure to be noticed and appreciated. This black glass and optical crystal gift is a perfect fit for professionals in the education or journalism industry. Pencil: 8" wide x 1" Dia. Scores of facets lend prismatic colors and a touch of elegance to our Radii Bookends. Made of solid optic crystal, this radiant set rests on a sleek base to insure your books stay in place.